April 2011 saw Global Rail News report Bircham Dyson Bell’s (BDB) appointment by HS2 Ltd to provide legal advice to its consultants on planning, environmental appraisal, public consultation and blight management, in a two year contract. “Work will begin with immediate effect, and we’re very pleased to have engaged with the major projects team at BDB who have a strong track record in this sector and genre of legal work,” said Alison Munro, Chief Executive, HS2 Ltd. In a candid BDB Law blogpost (23 December 2013) Stuart Thomson related some of the events behind HS2’s downward trajectory. […] YouGov’s figures show there is now a lack of public support for the plans, and they also suggested that there is a lack of support from the voters of the northern cities that are said to benefit economically from the plans. A real problem lies with failings in the statistics used. For instance, as part of the latest re-launch a new figure on how much delay and cost would be involved in an upgrade of the West Coast Main Line emerged. This seemed to be a fairly transparent scare tactic, focusing not on the benefits of the scheme but the dis-benefits of the alternatives. This confuses the message. None of this is to say that the communications have been faultless. Cities supporting the scheme came in behind it quite forcefully at first but then until recently went very quiet. Only now are they again publically rolling in behind the project. If the supporters are not supporting then why should anyone else? It has recently been suggested that tickets will be available for between £5 and £10. Quite how anybody can be sure 13 years before the line opens is unclear, but if this is the case then why not highlight this earlier? There has certainly been a lack of lead from the very top of the DfT and it has taken Lord Heseltine to make the most impact in recent months. The Government is also making efforts to retro-fit the project into the narrative centred on ‘winning the global race’. The communications for the project have got a raw deal. The issues go deeper and if these are not addressed then the Bill will have a difficult journey in Parliament which could impact on its timescale and progress. 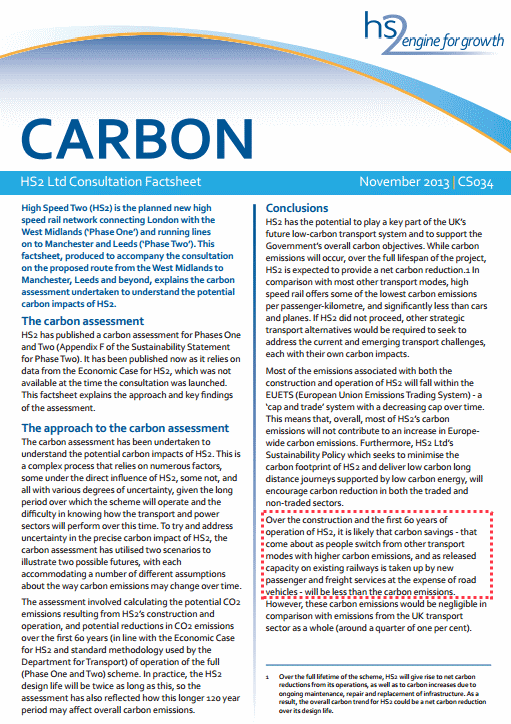 But there is nothing green about HS2 high speed rail, and HS2 Ltd have now admitted that the project would increase carbon emissions. The whole HS2 project is built on scaremongering, misrepresentation, and lies. Centro has produced audio and easy-read versions of its short-form consultation document on the transport authority’s future budget. Public consultation on the budget for the period from April 2014 to March 2016 is being undertaken from 25 November 2013 to 19 January 2014. Here are the pages from the easy read version. Birmingham council leader Sir Albert Bore had said that Centro needs to ‘play its part’ in controlling expenditure but Centro’s budgeting has always been framed to deflect prospective cuts away from the organisation itself. In 2009 chief executive Geoff Inskip was ‘awarded‘ a £24,000-a-year rise because his £131,000 pay was ‘too low’. As the Birmingham Mail revealed on 28 December 2013, Centro has ‘handed its 343 staff a £400 bonus for not being off sick’ at a cost of around £130,000. The seven West Midlands councils who fund Centro, are also locked in talks with the transport authority over an expected £1.6 million underspend, due to falling passenger numbers, which they are hoping to either get back, or use to reduce next year’s funding package. The budget consultation by-passes such topics, and public opinions are definitely not welcome on whether Centro should have 340-plus staff, bonuses for turning up for work, or a transport authority with no fewer than 27 councillors and eight committees. Whether you’re a NIMBY, a train-spotter or most likely an apathetic commuter reading this sitting on a crowded train to London, we can all agree it has been a bad, bad year for the high-speed rail project (wrote Benjamin Mulvihill for The Chamberlain Files). […] nobody is quite sure about any facts to do with the project because somewhat hysterical hyperbole has been allowed to escape into the ether. The result is most people know very little about the project, and what they do know has most often been through a lens of misinformation. Unfortunately, Mr Mulvihill went on to spread a little more confusion, by forgetting to mention the ~£6.9 billion cost of HS2 trains. But just so you know, dear readers – Phase 1 £21.4 billion and Phase 2 £21.2 billion, including contingency – not a ‘blank’ cheque. Now go, spread the word. Don’t alternatives to HS2 require rolling stock to be bought as well? Yes, they do. But very high speed trains are a lot more expensive to buy and maintain. Furthermore, a fifth of all HS2 travel would be generated journeys. HS2 Ltd has produced a diagram showing predicted large-scale population growth in London. Most journeys in the capital — like everywhere else in Britain — are short distance. So strong London population growth would indicate a need to fund improved transport in the city. With its ~£50 billion capital requirement, the HS2 project is bound to reduce funding for improvements in local transport in London and regional cities. According to Railnews’ Sim Harris, HS2 would “absorb most (not all) intercity traffic between London, Birmingham, Manchester and Yorkshire, leaving a lot of spare capacity on the West Coast Main Line (in particular)”. What can we do with this capacity? Well, we can run more trains of a non-intercity type, including commuter trains as well as freight. That’s the deal. More commuter trains. Fewer cramped, miserable journeys. Easy, really. Neither the government nor HS2 Ltd have provided any quantification of commuter benefits from HS2 for regional cities. However, they could be charitably described as meagre. If intercity trains between London and the North West were transferred to HS2, there would be capacity release on the West Coast trunk through Nuneaton and Lichfield. The quantum would depend on how many fast trains continued to operate. The government will not say. In any event, there is very little local demand on the WCML trunk in the West Midlands Region. There is a lot more commuting demand within the West Midlands county. But there, the only corridor potentially relieved by ‘HS2 London — West Midlands’ would be the Birmingham — Coventry one. If the classic New Street — Coventry — Euston service were cut from three to two trains per hour, one fast path would be freed. The overall effect on West Midlands commuting capacity (and crowding) from HS2 would be minimal. In Manchester, HS2 stage two (‘LMH’) could remove one or two fast Stoke / London trains from the Stockport corridor. Presumably, to avoid connectivity losses for Macclesfield and Stoke, there would have to be some kind of additional ‘local fast’ service put in place. Again, there are no official details available. It is safe to say that HS2’s overall effect on Greater Manchester commuting capacity, and crowding, would be minimal. Rail capacity utilisation in West Yorkshire was the subject of a freedom of information request to its Passenger Transport Executive, but apparently, ‘no information is held’ on the topic. Most of the population centres in West Yorkshire are west of Leeds, so for those towns, there is no possibility of HS2 providing commuter capacity release. Between Leeds, Wakefield, Doncaster, and Sheffield, there are duplicate railway routes (some not shown on the WYPTE map), so shortage of classic capacity is unlikely to be a problem. If you listen to HS2’s objectors, you hear eight bad arguments against the project (wrote George Muir for ‘Passenger Transport’, 18 Dec 2013). The factors causing car use to plateau do not apply to rail. Long distance rail travel continues to grow and has done so through the recession (see Figure 4). It is growing at about 4.8% per annum. GDP will grow, hopefully at 2.5%, but who knows exactly. The population is growing at 0.6% pa. We are not building any more roads. Put all this together and the 2.2% pa growth in rail demand assumed in the HS2 business case seems pretty reasonable. It is very hard to see it being less. As of 2013, Virgin Trains are, on average, well over half empty (average loading is below 170 passengers). In capacity terms, HS2 captive trains would be much bigger than Virgin’s, but the number of population centres served by them would be much lower. The Y network configuration works against high load factors; having principal East Midlands and Leeds rail demand served by the same London train is bound to lead to plenty of empty seats north of Toton. If rail subsidies fall, rail demand will fall. The government seems set to increase subsidies, however. (ii) in and around London. Population growth exacerbates the problem of accommodating the volume of short distance journeys, and the resource misallocation of HS2. In themselves, percentage growth rail rates are not instructive. A growth rate of 2.2% in London rail commuting, is an immensely harder task to manage, than a growth in long distance rail of, say, 5%. Yes, the Virgin WCML load factor at Euston in the peak is not too high and there are spare seats for future growth. London Midland trains, also running on the WCML, though now full and standing will shortly get 13% mores seats with their new trains. The Chiltern line to Birmingham has spare capacity. It sounds like a good argument, and I want to come back to it in detail in a later article, but it only takes you so far. It is extremely unlikely that the spare capacity, plus any extra which can be added, would not be fully used up by growth well before the Y of HS2 is finished. The WCML track is in a fragile state: it is heavily used; it is the most congested mixed use, four-track line in the world; maintaining it is difficult and its punctuality is suffering. These problems are not easily solved, even with money. I would not think you would want to be relying it alone in 25 years’ time. Finally, loading the WCML to the gunnels and cancelling HS2 does not give you the other benefits of HS2: use of the released capacity and travel time savings on the high speed line. If the WCML Fast Lines are in a fragile state, what state is the HS2 trunk going to be in, with “18 trains” an hour in each direction, running up to eighteen hours a day? Although large capacity uplifts can be achieved on the WCML, there is no reason to be over-reliant on one line in 25 years’ time. The Chiltern Main Line has plenty of spare capacity, and moving West Midlands intercity trains to the Bicester route is a low-disruption, cost-effective way of freeing up capacity on West Coast. South of Leicester, the Great Central corridor is also available to increase intercity and freight movements. Upgrades dispersed around the legacy network, provide more capacity and resilience than HS2, for less money. Objection 3: That the environmental damage to the Chilterns and the disruption to residents around Euston are so bad that we should abandon this project. Yes, there is damage and disruption and, yes, the project has to be properly justified. But remember, if a third runway is built at Heathrow and aircraft numbers rise, a lot of people, including me, will suffer worse. These things happen. The issue is whether HS2’s damage and disruption — in and outside London — is necessary, or worth the costs. On the evidence available, the answers are: no, and no. Yes, many of the long distance trains now running will continue to run – as the literature fully recognises – but HS2 will allow a change to their stopping pattern. They can become new Fast Regional or Regional Stoppers and many places will see an improved train service. Calculations in the KPMG report show substantial increases in regional connectivity arising from these new services. The details are important so, again, to be addressed in a later article. The details are important, so by now, one might have expected an official detailed explanation of (i) what capacity would be released on existing lines, (ii) how that would be used. There hasn’t been one. In the Birmingham conurbation, capacity release provided by HS2 would be minimal, and in essence confined to the Birmingham to Coventry line. In Manchester, HS2 prospects for capacity release are limited to the Stockport corridor. If the legacy Manchester intercity service were cut from three trains per hour to one, there would a capacity saving (if the two trains were not resurrected under a different name). In path release terms, much the same results are achievable by low-cost local reconfigurations (e.g. extending Metrolink as tram-train beyond Altrincham, thereby removing the need for trains to run into Stockport). Between Sheffield, Wakefield, and Leeds, duplicate rail routes are available, and there is no real evidence of capacity shortage. Most of the West Yorkshire conurbation is west of Leeds. HS2 provides no capacity uplift to and from big towns like Bradford, Halifax, and Huddersfield. HS2 will not be painless for the north. There will be change and some disruption. Some high value activities will move to London, but London things will move north. Birmingham, Manchester and Leeds in competing with each other will drop some activities and focus on others. It will not benefit everyone: people without skills will lose out. But, as the Centre for the Cities spokesman said this morning, “Birmingham is not competing with London, it is competing with Barcelona”. Rapid access to the specialisations available in London must be an advantage. Anyway, Birmingham, being effectively the hub of the new network, is going to be a very big winner. HS2 would be certain to provide some benefits for ‘the North’. However, at the national level, the true monetised economic benefits are likely to be lower than the costs (as happened with the Spanish high speed network). For the North and the entire country, the opportunity costs of sinking £50 billion into a prestige rail project designed to link three provincial cities with London are immense. OK, this is possibly true in the short term, but no one has come up with anything concrete and plausible that addresses long term growth and delivers the same connectivity improvement. Perhaps there could be another way to relieve crowding on the London ends of the major rail routes (eg Crossrail 2, 3 and 4) but if we did just that, we would further cement in the position of London. HS2 would not relieve much crowding on the London ends of the major rail routes. The relief would be largely confined to the London Midland commuter service (even in stage two). Most rail demand is to, and from, the east and south of London. Surely the best way to improve rail connectivity in the North, is to invest in rail connectivity in the North; HS2 is really only designed to connect Birmingham, Manchester and Leeds to London. You can chip away at the edges if you want, but a benefit cost ratio of 2.3 (with wider economic benefits, which will happen) for a large project is good. Obviously small projects – road by-passes and suchlike – can have higher BCRs but such projects are always on the margin. You can’t build a network out of by-passes: something has to join them up. By their nature, very large projects don’t have high BCRs, but they sometimes have to be done. Some argue that the value put on time saved – a large part of the total benefits – is bogus. People work on trains. Yes of course they do, but I cannot believe that the average business would not, if it could, spend £32 to have its staff spend an hour less on the train. The HS2 business case is poor, and its benefit cost ratio is below that of lower risk alternatives based on the classic network. Subject to a given funding constraint, projects should be progressed in order of benefit – cost performance, and absolute size is irrelevant. If an investment of, say, £100 produced a return of £7, that would not be ‘better’ than three smaller investments with individually lesser returns (e.g. £25 yielding £2.50, £30 yielding £2.80, and £45 yielding £3.90). The £15bn a year figure is entirely plausible and the HS2 Action Alliance is talking tosh and is deliberately misunderstanding the KPMG work, or they are very dim. Indeed, that so many economists object or sit painfully on the fence, given their record on other things, is a source of great encouragement. This, however, is for another article. If there were 60 million HS2 round-trip journeys (i.e. 120 million one-way) and the annual benefits were £15 billion as claimed by KPMG, the average economic benefit per return trip (including journeys by children and pensioners) would be £250 at current prices (with 120 million round trips: £125). BBC television’s the One Show (17 December 2013) reported on the volume of documents produced for HS2’s London — West Midlands Hybrid Bill, and the unreasonably short timescale allowed for responses. HS2 Ltd stated that parish council libraries along the route have been provided with a searchable electronic version of the documents (presumably on a USB stick). However, community libraries tend to have very restricted opening hours, and presumably, only one person at a time would have access. The government and HS2 Ltd should have provided document USB sticks free of charge to the public, and allowed an adequate time period to formulate responses.